Jeep has a pair of new Renegade models that will turn up at the LA Auto Show that looks pretty cool. 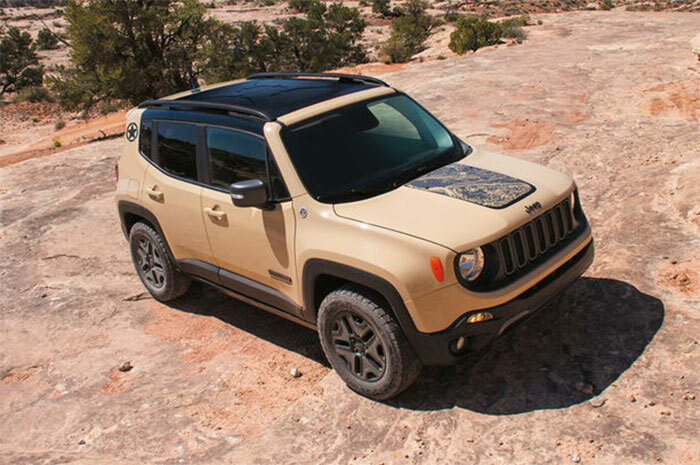 On of them is a new 2017 Renegade Deserthawk and it wears a special beige paint color called Mojave Sand. the Deserthawk is based on the Trailhawk version and packs AWD and a 180hp 2.4L engine. If that beige paint isn’t for you, the Deserthawk can be had clad in Alpine White, Anvil, or Black colors. It will sell for $29,135 and there is no word on if it will have special features differing from the Trailhawk. The Renegade Altitude is also bowing in with glossy black wheels, black exterior and interior accents, and black seats. You can get the Altitude version with any paint color available in FWD or AWD versions. Altitude starts at $23,385 for a FWD version with manual transmission and 1.4L turbo four engine. The blacked out Altitude if aiming right out the folks out there who like the murdered out look.